Most people these days have some kind of Smart-phone, Netbook or Laptop. But many of us also still need hulking behemoths of power stashed away at the office to do our main work. Our studio, for example, would never run on any kind of laptop and certainly not a netbook (correct at time of publishing 2010) – Music and video need big horse-power. Others will require a super-powered rig for photo editing and even gaming. Having trouble with WOL using Windows 8? 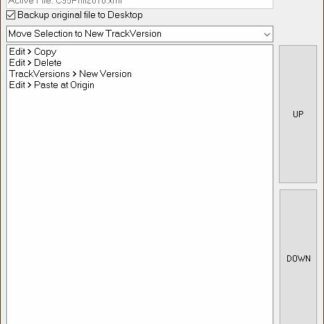 Take a look here: Windows 8 – Wake Over LAN – It Works! 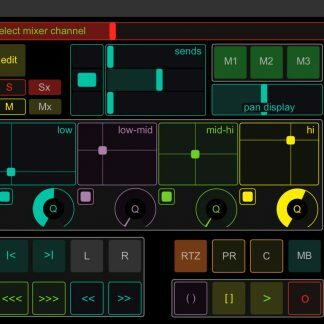 So how cool would it be if you could be driving to your studio and save yourself a bit of time by turning on your PC remotely from your smart-phone. (Rhetorical question). For time saving geeks like me – it IS cool! But it’s not that easy to set up. Wake On LAN is not such a huge problem but Wake Over Internet can be a nightmare. So here’s how it’s done – Step by Step – I am presuming a certain amount of tech knowledge here but it is not necessary to understand fully about networking and so on. 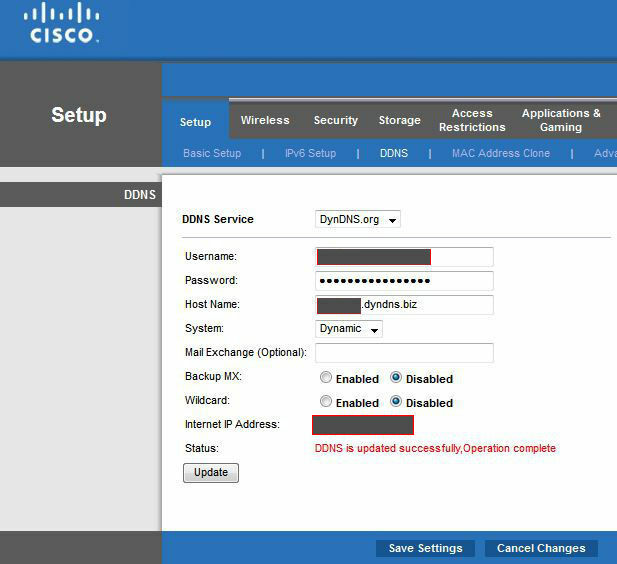 This walk-through was written using the D-Link DIR-855 but I have now switched to the CISCO E4200 and added the relevant screen shots and information below. 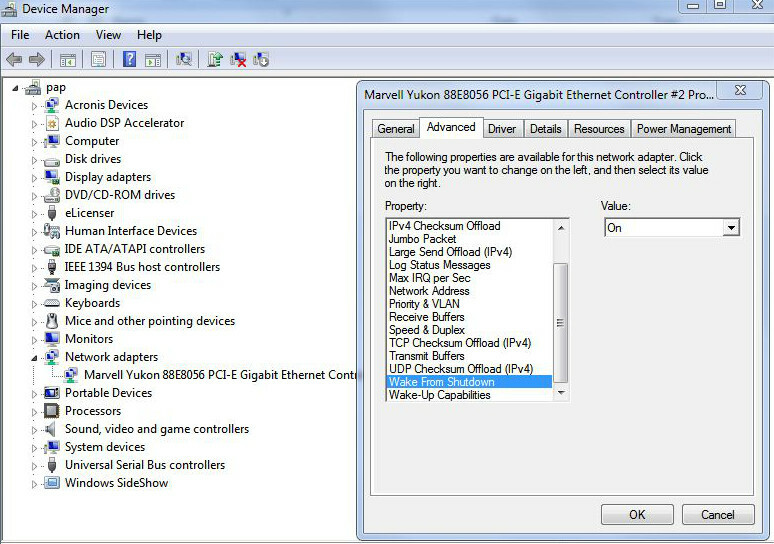 First you need to go into your computer BIOS and make sure it will accept remote power wake up to your LAN card. This could be simple ENABLE WAKE ON LAN switch. Or it may be under ALLOW POWER UP BY PCI/PCI-X CARD. After booting into Windows we must then make sure that the software is set up to receive a magic packet and enable remote powering. 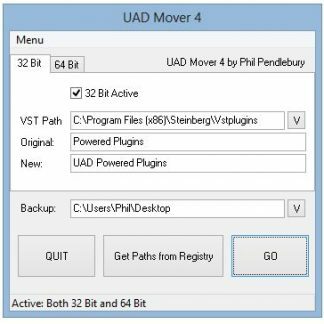 This is done in Device Manager and is a step often missed. 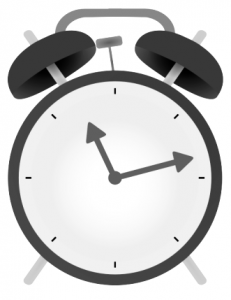 Be sure to check that Wake From Shutdown is ON, Wake Up capabilities are all ON and that Power Saving (power down if idle) is OFF. The next step is to head over to https://www.dyndns.com/ and make yourself a free account. Make yourself a free dynamic DNS host and name it whatever you like. Also put in your current location IP. It can be seen next to the text “Your current location’s IP address is” This is NOT the same as your local network IP. 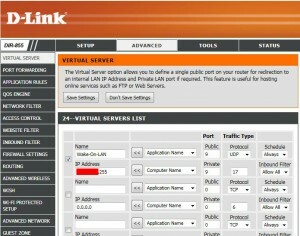 DLINK DIR-855: Now you will need to set up your router to accept the hostname and open the correct ports for WOL/WOI. 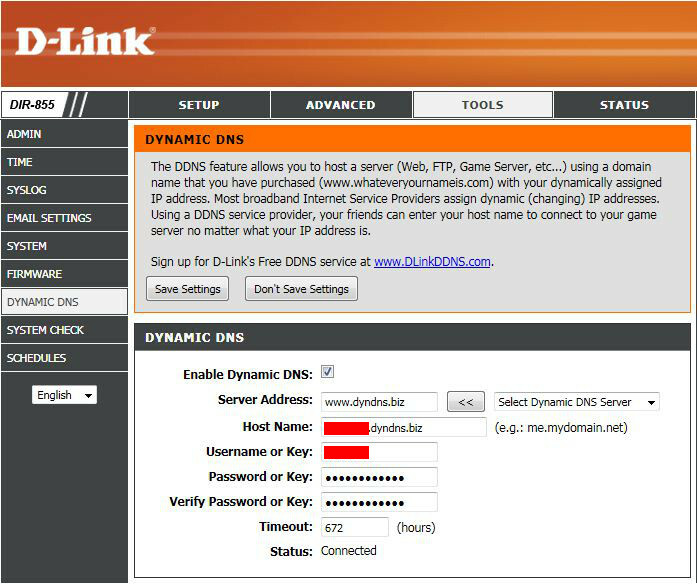 In the D-Link Routers this is done by first going to the DYNAMIC DNS page and entering your host details. CISCO Linksys E4200: Go to the DDNS page and enter your host details. 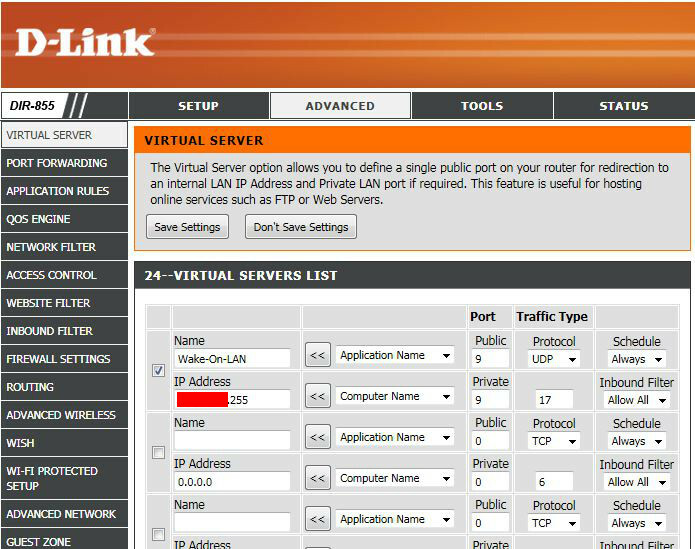 DLINK DIR-855: Then go to the VIRTUAL SERVER page and open up the ports (usually 9) required for WOL. Also the IP must be set to the same as your router but it must end with 255 if possible. If not possible add the IP of the machine that you want to wake up. 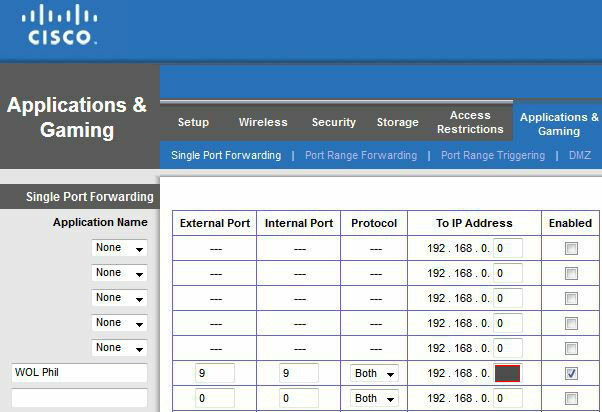 CISCO Linksys E4200: Go to the SINGLE PORT FORWARDING page and open up the ports (usually 9) required for WOL. Also the IP must be set to the same as your router and the machine you are targeting. OK we’re nearly done. Before you leave your router set up it would be a good idea to make sure you have reserved a permanent IP address for your PC (This is on your network only – We are not referring to a permanent IP from your internet provider). 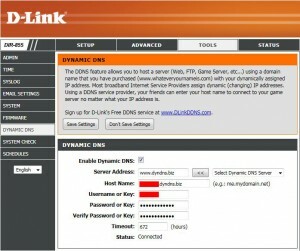 This is done in D-Link Setup > Network Settings >Add DHCP Reservation. Pick an IP for your PC and reserve it using your LAN card MAC address. 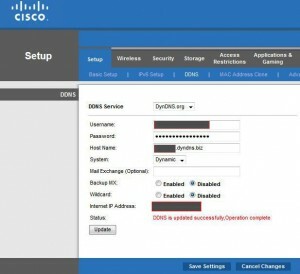 CISCO Linksys E4200: The DHCP settings are on the main Settings page. Click the button named DHCP Reservation. The final step is to get yourself and application that will send out the magic packets required to wake up your office PC. In this example I am using the excellent iNet App for iPhone. First we add our PC and edit the PC details. 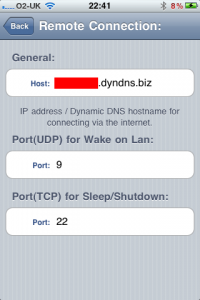 For Wake On LAN we add the IP address of our PC. 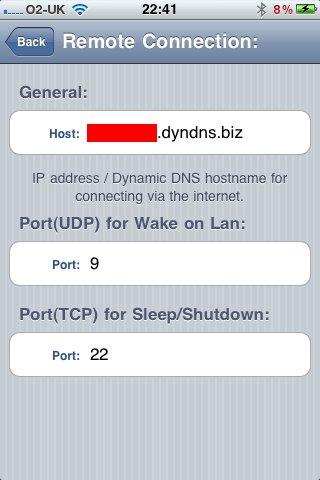 For Wake Over Internet we add the DynDNS hostname we created earlier. We also need to add the MAC address of the PC’s LAN Card. Then in the Local Connection page we add the IP of our PC and the Subnet Mask. 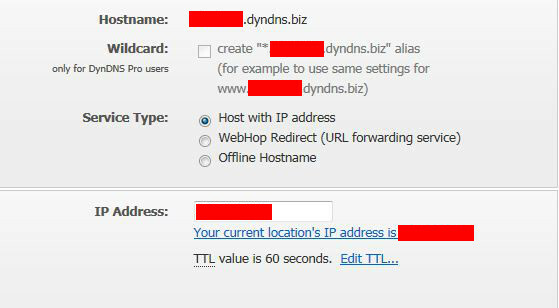 Finally in the Remote Connection page we need to add the DynDNS hostname and make sure the ports are configured correctly. And that is about it. After rebooting your PC and Router and probably a little but of trial and error, you should now be able to remotely wake up your PC from anywhere you have an internet signal (including 3G). Very neat. There are a few things to watch out for here. You must have reserved a permanent IP address for your PC (This is on your network only – We are not referring to a permanent IP from your internet provider). This is done in D-Link Setup > Network Settings >Add DHCP Reservation. Pick an IP for your PC and reserve it using your LAN card MAC address. 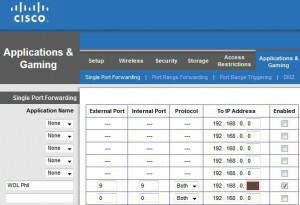 CISCO Linksys E4200: The DHCP settings are on the main Settings page. Click the button named DHCP Reservation. If you have two LAN cards on your motherboard – Make sure you choose the MAC address and BIOS settings for the correct one that is in use. This will only work with a rig that is hard-wired to your network. the Wake Up call can be sent from anywhere but must be received by a machine connected to the router via LAN cable. Try it using Wake Over LAN first. then move on to Wake Over Internet. Yes this is a pretty basic guide but there is a lot of info here that I could not find anywhere else, especially in a step by step walk-through. I hope you may find this useful. Good luck and thanks for reading and of course any questions please feel free to comment.